Taxicab geometry is very similar to Euclidean coordinate geometry. The points, lines, angles are all the same and measured in the same way. What is different is the notion of distance. In Euclidean coordinate geometry distance is thought of as �the way the crow flies�. In taxicab geometry distance is thought of as the path a taxicab would take. 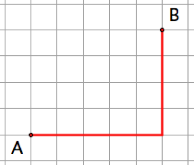 The blue path from point A to B is the Euclidean distance from A to B. 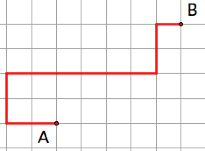 The red path is the taxicab distance from A to B. While there is only one Euclidean path from A to B, there are multiple taxicab paths from A to B. These are a few examples of taxicab paths from A to B. Which is the shortest path? Can you find an even shorter path? What do you think would be the path a taxicab driver would take? 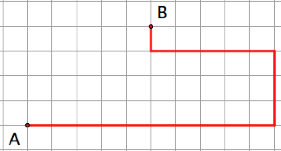 lengths of the vertical and horizontal distances from A to B.